September 2000 is Archaeology Awareness Month in Wyoming. This event consists of a series of statewide activities and programs devoted to educating the public about the value and importance of Wyoming's archaeological heritage. It is sponsored by a consortium of professional and avocational archaeologists to promote knowledge and stewardship of our state's cultural resources. 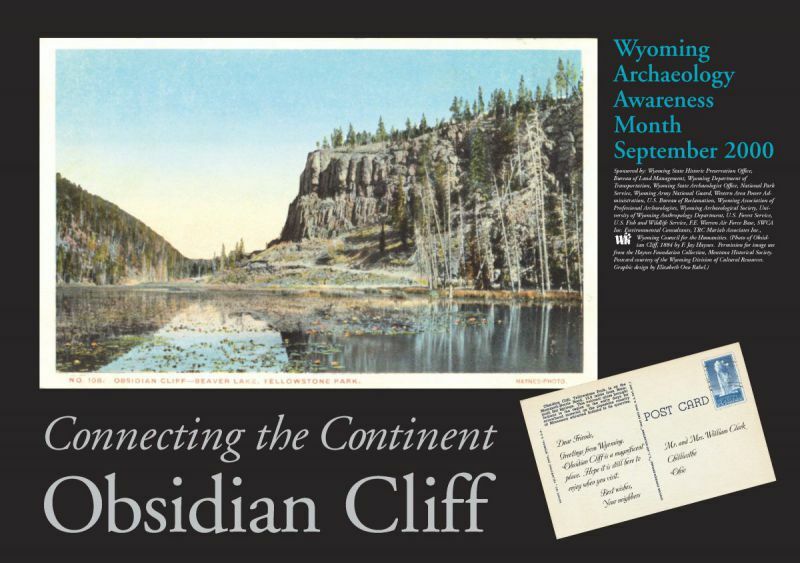 The theme chosen for Wyoming Archaeology Awareness Month 2000 is "Connecting the Continent". Obsidian Cliff, located in Yellowstone National Park, was chosen to portray this theme. Obsidian Cliff is an internationally recognized site which symbolizes the ability of archaeology as a discipline to link people through time and space and across cultures. Yellowstone National Park's Obsidian Cliff Plateau is one of the most renowned sources of obsidian in the United States. The site's obsidian, a shiny volcanic glass, was used in the manufacture of stone tools by past Native American peoples for more than 10,000 years. The volcanic glass was quarried and made into many types of tools, from simple flake tools used to cut hides or butcher animals for meat, to arrowheads or spear points, to large ceremonial artifacts. The wide temporal and geographic distribution of tools and debris associated with the manufacture and trade of obsidian implements attests to the popularity of this raw material to Native Americans through time. For archaeologists, obsidian is very useful in providing insights about the lives of past Native Americans. Each geologic source of obsidian has a unique chemical composition of trace elements that can be identified through sophisticated x-ray techniques and other methods. By analyzing the chemical composition of the artifacts and the geologic sources, such as Obsidian Cliff Plateau, obsidian artifacts can be traced to their geologic source by their "chemical fingerprint." Through these techniques, it has been found that prehistoric peoples started using Obsidian Cliff obsidian from earliest Clovis and Folsom times, more than 10,000 years ago, up until the recent past. Historic records indicate that in the early 1800s white explorers and trappers in the Yellowstone region encountered Sheepeater (Shoshone) Indians carrying arrows tipped with obsidian arrowheads. The special place of Obsidian Cliff in the prehistory of North America is also demonstrated by the wide geographic range of its obsidian. Besides western Canada and all the states surrounding Yellowstone and Wyoming, obsidian has been found in archaeological sites throughout the Midwest, as far east as Ohio, a distance of more than 1,500 miles. The archaeological obsidian found in Ohio mostly belongs to sites of the Hopewell Culture that flourished from around 1,600 to 2,200 years ago. People of the Hopewell Culture built many complex ceremonial centers with large mounds and other earthworks. At these sites a wide range of exotic raw materials from distant locales were collected and traded, including obsidian from Yellowstone, marine shells from the Atlantic and Gulf coasts, and copper from the northern Great Lakes region. Evidence from the Hopewell sites indicates that much of the Yellowstone obsidian was transported to the Midwest in very large pieces and then made into hundreds of large, beautiful artifacts, some nearly 15 inches long. One piece of obsidian found at a Hopewell site weighed between 25 and 30 pounds, providing some idea of the size of items transported out of Yellowstone. It is not known exactly how the Yellowstone obsidian actually got to these distant locales, but it is likely that exotic goods moved through overlapping trade networks across the continent. While exotic items such as obsidian may have been the primary goal for the trade, news and information were also likely exchanged, linking peoples occupying the vast distances of the continent. It is probably no coincidence that at the same time obsidian was being transported to the Hopewell groups, there was also an increase in the use of obsidian in the Yellowstone area. The importance of Obsidian Cliff to the prehistory of the United States is demonstrated by its listing as a National Historic Landmark. This designation emphasizes that such places need to be preserved and protected so this valuable resource can be available for future generations to study and enjoy. While the unauthorized collection of cultural or natural specimens from Yellowstone has been illegal for more than 100 years, the importance of Obsidian Cliff makes it even more crucial that people are discouraged from this practice. This situation is becoming more difficult to control due to the millions of tourists visiting Yellowstone National Park annually. The cumulative effect of unauthorized collection severely damages this non-renewable resource.